ODOREZE Natural Clothing Smell Removal Laundry Additive: Makes 64 Gallons to Clean Stinky Clothes Summary Get rid of clothing odor using the power of nature. 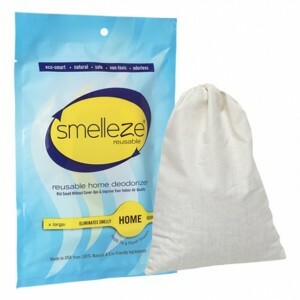 Odoreze™ Natural Clothing Odor Eliminator Spray will remove laundry smell without harmful fragrances. This bio-based concentrated clothing deodorizer makes 64 gallons & really works! Clothing mildew smell, sweat smell & washer odor doesn't stand a chance. 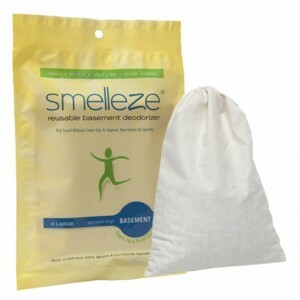 Features & Benefits • Removes clothing smell instead of masking them • Bio-based deodorizer made from natural ingredients • No carcinogens, phosphates or harmful chemicals • Biodegradable, non-toxic, eco-friendly & effective • Economical- only costs 45 cents/working gallon • Made in USA Get Rid Of That Stinky Odor In Your Clothes For Good! Perhaps you spent too much time in a cigarette-loving friend’s home or got gasoline spilled on your clothes during a routine auto repair. Maybe an old pet with bladder issues forgot that your lap is not a toilet, your favorite shirt became a biohazard from too much perspiration, or those pants you always wear got left in the damp basement and are covered with mildew. Whether you are dealing with a chemical odor or another unpleasant powerful smell rendering your clothes unwearable, we have the solution you really, really need. Odoreze™ Natural Laundry Deodorizing Additive eradicates a wide variety of odors, including urine, mothball, smoking, pet, mildew, gasoline, cooking, fish, perfume and chemical smells. The powerful deodorizer features a unique blend of natural, environmentally-friendly ingredients that attack and destroy odors instead of covering them with fragrances, which does little more than add scent to displeasing smells! This amazing product is super-easy to use. Simply pour 2-3 teaspoons of the non-toxic, biodegradable, non-flammable Odoreze™ super concentrate additive into your washing machine AFTER it has filled with water and wash your clothes. It can be used along with your regular detergent or by itself. For items with really severe odors, you may first pre-soak the odor laden clothing in Odoreze™ (diluted 2 teaspoons/gallon) overnight and then wash them with your regular detergent plus Odoreze™. Do not pour concentrated Odoreze™ directly onto clothing to avoid staining. Getting tough odors out from clothing has never been easier! Utilize the wondrous power of Odoreze™ Natural Laundry Deodorizing Additive and say goodbye to stinky odors and other nastiness affecting your clothing. It’s as easy as doing a load of laundry!